Have you been following us on Instagram? 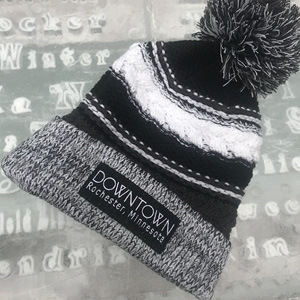 If so, you probably saw that we just released our new Downtown branded hats! Our ice cravers have been enjoying the warmth from them while they have been hard at work transforming the Peace Plaza for SocialICE, but now it's your chance to get your hands on one! We will be hosting a flash sale tomorrow, Wednesday, February 6th at our office (311 Broadway Ave South, Rochester, MN 55902) from 11:30AM to 1:30PM. During this time the hats will be $15. Can't make that time work? No worries, we will also be selling them onsite during SocialICE and SocialICE FAM JAM in the kiosk for $20 each. Show Downtown Rochester how you #SocialICE! We are hosting our annual SocialICE photo contest, so get those selfies ready! We will have three different photo categories to choose winners from: photo of an ice bar, photo with giant SocialICE letters, and a general event photo. Six lucky winners will each be receiving a $50 gift card - that's $300 in giveaways! Make sure to follow our SocialICE Facebook page for updated details, and follow Downtown Rochester MN on Facebook, Instagram, and Twitter as we announce all the details on these activities and more! P.S. Are you heading to SocialICE FAM JAM? Those selfies are eligible to win, too!